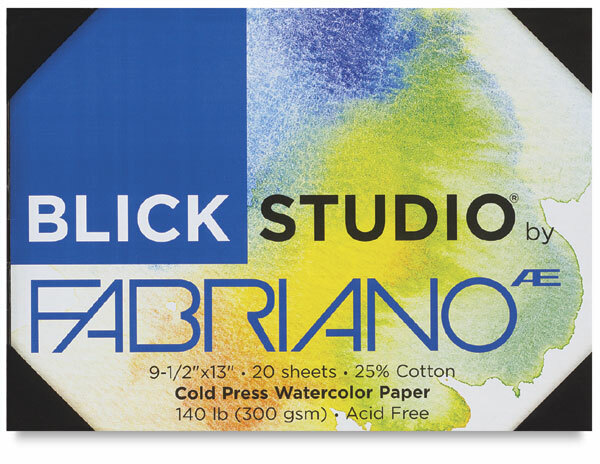 Blick has partnered with Italy’s Fabriano mill, producer of fine art papers since 1264, to develop this versatile, durable, and economical watercolor paper. Available in both cold press and hot press surfaces, Blick Studio Watercolor Paper by Fabriano is excellent for watercolors, tempera, gouache, acrylics, inks, markers, drawing materials, and mixed media. Ideal for students and artists, this 140 lb (300 gsm) paper contains high-quality 25% cotton and 100% ECF (Elemental Chlorine Free), FSC-certified (Forest Stewardship Council) wood cellulose pulp from responsibly managed forests. It is made on a continuous Fourdrinier machine using artist-quality felts to produce true watercolor paper textures. 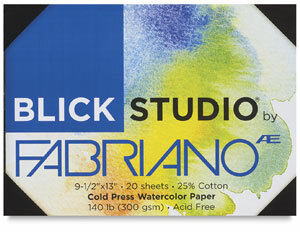 Blick Studio Watercolor Paper by Fabriano is archival, acid-free, and pH-neutral for lasting beauty. It is both internally and externally sized for optimal absorbency. Enduring works by Michelangelo, da Vinci, Dürer, Raphael, and Goya attest to the quality and longevity of Fabriano artist papers. Package of 10 Sheets — 10 full-sized sheets contained in a protective plastic bag. Each sheet measures 22" × 30". Package of 20 Sheets — This unique 4-corner pack allows easy removal and storage of sheets. Pack contains 20 sheets, each of which measures 9½" × 13" or 13" × 19". ® Blick and Blick Studio are registered trademarks.® Fabriano is a registered trademark.